At the end of January 2008 Andrej Grmovsek and Marko Lukic free climbed onsight the Dru North Couloir Direct (VI 6+ M8, 700m), a line that goes between the Grand Dru and the Petit Dru that Grmovsek described as "one of the ultimate hard mixed climbs above Chamonix." The first third of the climb consisted of 60-80 degree slopes and some delicate climbing on slabs with only a few centimeters of ice and some difficult dry sections. Jakofcic said that in good winters there is an easy gully leading up, and last year many teams climbed the classic Dru Couloir, and they didn't notice any difficulties in this lower part. The second part was a steep and sometimes overhanging dry mixed corner that Grmovsek said is the "heart of the direct line and offers five pitches of perfect climbing at quite a high grade." This section of the climb had some short aid climbing, and Grmovsek said there was probably less ice than in previous deacades. 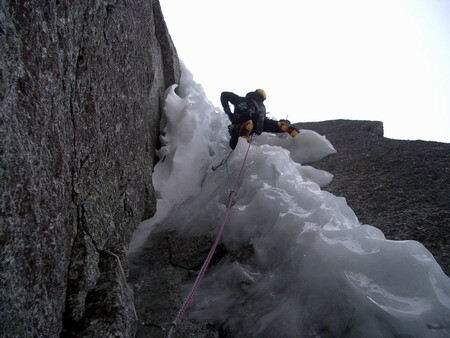 The last third of the climb is in the 60-80 degree ice couloir between the Grand and Petit Drus. Grmovsek and Lukic completed the route in thirteen hours and then rappelled. Grmovsek said it was by far the best mixed climb he had done. On the last week of December 2007 Tanja and Andrej Grmovsek climbed Scotch on the Rocks (IV M7, 450m) on the east face of Mt. Blanc du Tacul, then M6 Solar (M5+, 200m) and also rarely climbed route on Petite Verte, Imasscre (V+, 450 m) on which Tina Di Batista joined them. The routes were almost totally dry at that time. On picture Marko Lukic leading the overhanging ice exit on the Dru North Couloir Direct.